LOUIS VICKIO repeats himself, just so you know: "We lost a lot of money," he says, "a lot of money." In turns gregarious and pensive, self-deprecating and self-confident, obsessive and pragmatic: combined together these qualities make Vickio seem almost half mad. The bearded and boisterous Houston entrepreneur has taken a moment from his breathless responsibilities as the founder and main organizer of the Galveston World Classic. He counts off the expenses, one by one - but only those in which his Taylor Road Productions has shelled out $30,000 or more. There's the bleachers, he says, and the lighting and scoreboard. He seems tired as he speaks, but also energized. And after 12 long days, he seems almost a little punch drunk, maybe half crazed. But with its scores of Diamond tables, its row upon row of bleachers, the bright-lit TV arena - all 100 percent financed by Vickio and his Taylor Road Productions during the worst recession since the Great Depression - maybe a touch of crazy helps. What would happen if you held a world tournament and nobody came to watch? Between Sept. 11 and Sept. 20, down in Galveston, Texas, Louis Vickio found out. Nothing less than the best players in the world were on hand. Vickio helped finance high-dollar payouts in 8-ball, 9-ball, 10-ball and one-pocket. There were amateur events galore. He did not simply host a tournament. He cooked up an extravaganza. And yet the bleachers remained largely empty, the desolation so complete that one almost expected to see tumbleweeds blowing through. "How's business?" I asked one vendor. He cast a pained glanced heavenward, "What business?" But here's the thing: Despite all the setbacks - and they were numerous and serious - Vickio has found some measure of success. He was told a hundred different ways why his tournament could fail. Too big, they told him. Pros won't come, can't afford it, they said. Too ambitious. But with Hall of Famers Efren Reyes, Johnny Archer and Allison Fisher there and with top prizes reaching $25,000, Vickio can rightfully claim that he has pulled off a major event. 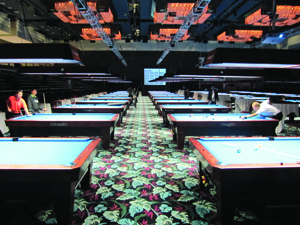 Players from 13 different nations were represented, including a contingent of top Filipinos and Finland's Mika Immonen, 2008 Billiards Digest Player of the Year. (Many other Europeans, however, skipped the event due to a scheduling conflict with EuroTour and Predator 10-Ball events.) And while it's true that the winners left with much less money than promoted, it's also true that Vickio eased the pain with plenty of added cash. And perhaps most important of all, Louis Vickio has convinced Louis Vickio. The losses mounted for his newly created firm, Taylor Road Productions, but the New York native insists his model will work. Come hell or high-water, Vickio says he'll be back in 2010. But that's not all. Soon, sometime very soon, Vickio envisions even more tournaments - not just one each year, but four or eight or even twelve! Shockingly, brazenly, this energetic promoter with no prior experience in the field, the man who hemorrhaged money in Galveston, says he wants to create the first men's pool tour in America since Camel pulled out 10 years ago. "I'd like to start as soon as possible," says Vickio.